Shiner's Jamie Machacek gets beat to the second base bag by China Spring's Jeff Tabor during third inning play. Shiner went on to win the Class 2A title game 5-4. AUSTIN —- Daniel Boedeker has always struggled as a reliever but with a state championship on the line, there was no one Shiner coach Steve Cerny would rather have on the mound. After yielding three straight hits, Boedeker got the final four outs to preserve Shiner's 5-4 Class 2A state fina] victory over the China Spring Cougars before 5,213 on a sunny, hot Friday afternoon at Disch-Falk Field. China Spring, which was making its fifth state tournament appearance, finished with a 26-3-2 mark. Boedeker had hoped to play the entire game at shortstop after throwing 118 pitches and a five-hit shutout in Shiner's 3-0 semifinal victory over Holliday Thursday night. But Boedeker was forced into the game when starter Wayne Otto (6-4) had the finger on his pitching hand spiked by China Spring's Jeffrey Scoggins on a play at first base. Otto was running to the bag and bent over in an attempt to catch an errant throw from first baseman Jason Wegener when the injury occurred. China Spring shaved a 5-0 deficit to 5-2 on the play, and three consecutive singles off Boedeker pulled the Cougars within 5-4 with runners on first and second and two outs. Boedeker struck out leadoff hitter Gilby Beckham to end the sixth and then retired China Spring in order in the seventh, striking out clean-up hitter Eugene Yedinak to end the game. Otto was on target after escaping a first-inning jam. Beckham led off the game with a triple and Otto walked Nathan Self, who then stole second base. But after a meeting with Cerny, Otto struck out the side and surrendered only one hit until the sixth. Otto's performance in the first inning seemed to inspire the Comanches, who jumped on China Spring starter Jimmy Holcomb (9-2) for three runs. Jason Nerada singled and scored on a Chad Kubecka triple. Kubecka scored when Otto reached on an error by second baseman Jeff Tabor. Otto came home on singles by Boedeker and Randy Machacek. Shiner added a run in the second on a sacrifice fly by Kubecka and made it 5-0 in the third on a double by Boedeker and a single by Jamie Machacek. Otto breezed into the sixth and struck out the first two batters he faced in the inning. But Yedinak singled and James Tindell drove an 0-2 pitch off the wall in right field to break up the shutout. “I hung a curve,” Otto sighed. Otto would throw one more pitch before leaving the game. As a result, Cerny knew it was time for Boedeker. Jimmy Holcomb, Nathan Self (6) and Eugene Yedinak. Wayne Otto, Daniel Boedeker (6) and Randy Machacek. W — Otto (6-4). L - Holcomb (9-2}. S - Boedeker (2). 2B - (S) Boedeker. 3B — (CS) Gilby Beckham, James Tindell, (S) Chad Kubecka. 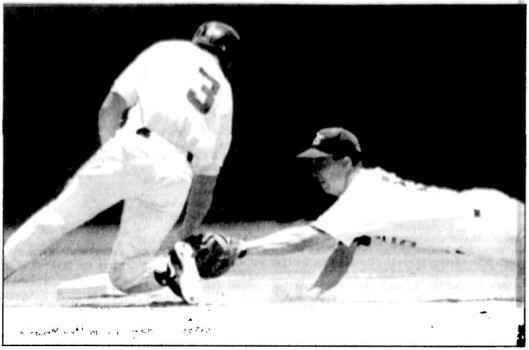 In 1992, Mike Forman was a sports writer for the Victoria Advocate.